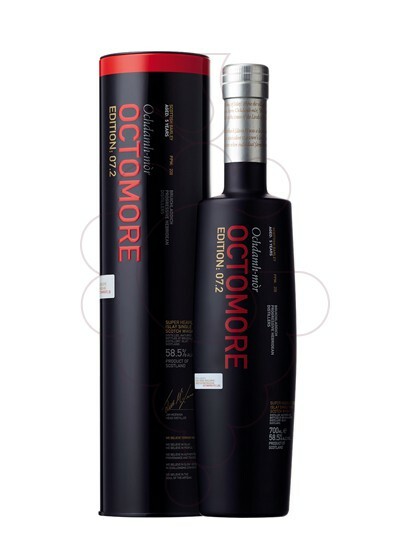 Here’s this year’s cask-finish Octomore, the travel retail exclusive 07.2 finished in French red wine casks which previously held wine made with those famously peppery Syrah grapes. I’ve been wanting to try this for a while! These TREs from Bruichladdich can go for silly money so it took a while to source one at a sane price. Nose: Opens with salty dark chocolate, orange wine gums, blackberries. Damp earthy peat bog leading to herbaceous lavender and dry basil. A faint sulphurous edge which, combined with the salt, reminds me of the smell you get when opening a pack of vacuum packed wafer ham. Finish: Long, lipsmacking oily peat with salt and pepper, and a touch of citrus. The peat’s very sticky – you can almost chew it. Slightly ashy, like the mouthfeel after a cigar. Clean fruit meets dirty peat! I don’t like it as much as the 06.3 Islay Barley but it’s got a certain appeal for sure. That intense muddy peated chocolate character that runs through Octomore acts as a good backdrop for those red fruit high notes. Another worthy experiment, Mr. McEwan. I picked this up for about £88 on WhiskySite.nl – they’ve sold out now, but they do still have the 06.2 version for the same price. I sooo love this one. Reviewed it a short while ago, too. Of course, I found only highest praise for it!